I’ve been in the technology industry for 20+ years, and in that time, the hackathon has entered the common vernacular that is used in software development. The core idea behind hackathons themselves aren’t new; my senior year of college was a series of extended hackathons, and earlier in my career I certainly had “working weekends” to work on a problem that was bothering me, unfettered from the day-to-day demands of the business. For example, at Amazon.com, I spent a weekend building an internal tool that allowed us to track website reliability issues. That tool became an integral part of the overall Amazon.com website availability effort, and it was still in use when I left in 2015. When I later led the Alexa team, the Home Automation and Audible applications were originally prototyped as part of a hackathon we did in early 2014. Giving people on large distributed teams (like ours) a chance to work with folks they might not work with on a day-by-day basis. Having a good time, because they’re incredibly fun. Of course, like any good hackathon, we decided that we would create prizes for the best demos. Our categories were Best Overall, Most Innovative, Best UX, Most Potential Revenue, Best Operational Improvement, and Audience Award. 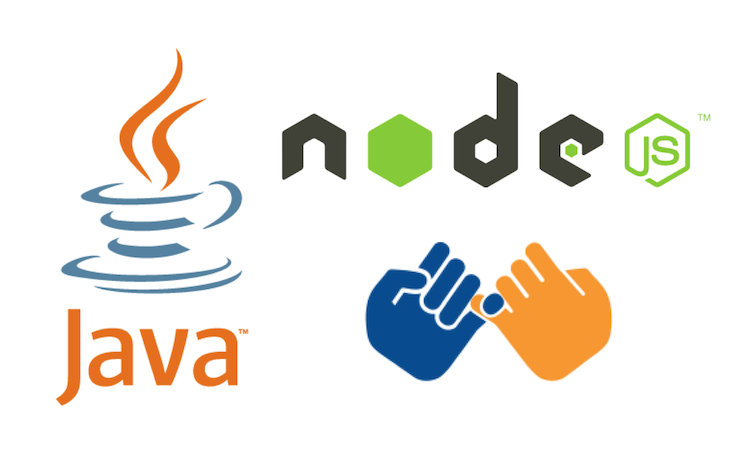 We set aside two hours on the Monday morning following the hackathon, and we went through all 20 demos. We used our own product to do judging, and were able to tally results in real time and announce winners at the end of the two hours. A view of the judging process. Qrapper. 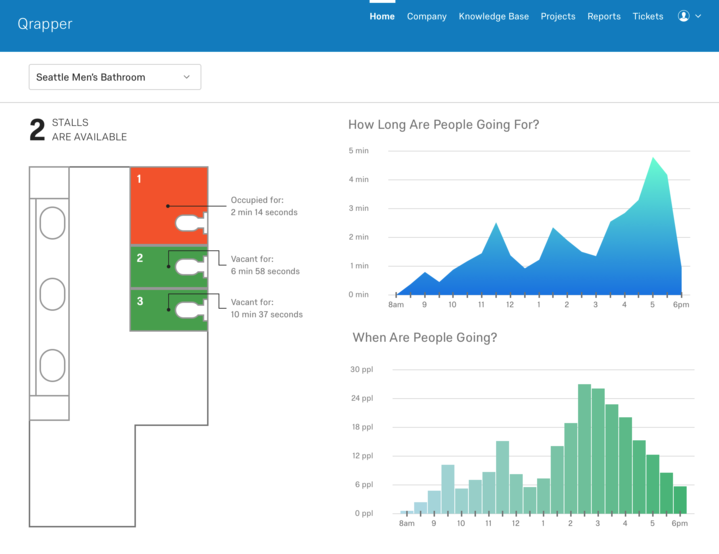 The team used some sensors to figure out bathroom occupancy rates, which fed a visualization so people could avoid busy bathroom traffic in our office. Genius. The UI presented for Qrapper. Qualexa. 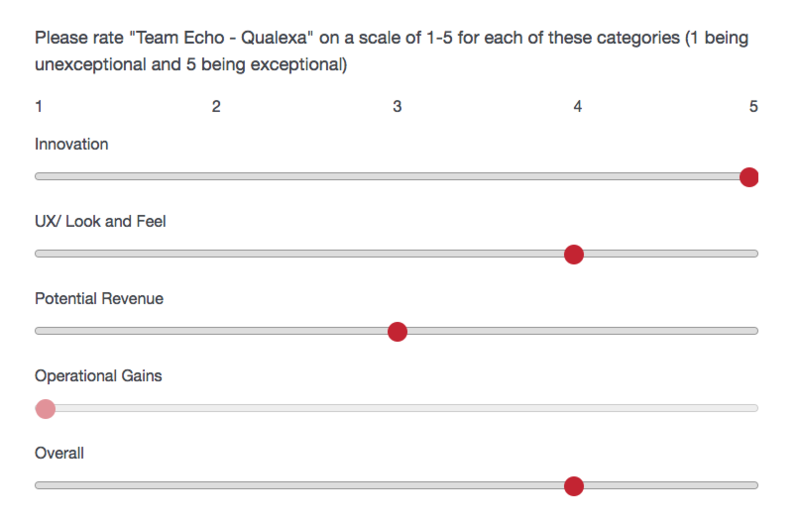 A team built an engine that would allow surveys to be taken via Alexa, Amazon’s personal assistant. There is huge potential here in allowing our customers to get feedback via natural voice interfaces. Benchmark library. Benchmarking is a common use case for some of our customers, and we had a team build a complete interface for allowing benchmarks to be created, modified, and ultimately, purchased. Once purchased, they would automatically show up in our reporting system, to allow our customers to understand how their results compare against established benchmarks. The MVP for our benchmarking interface. On Call Me Maybe. Most teams at Qualtrics have an established “on-call” resource, who monitors systems and performs operational tasks for a week at a time. 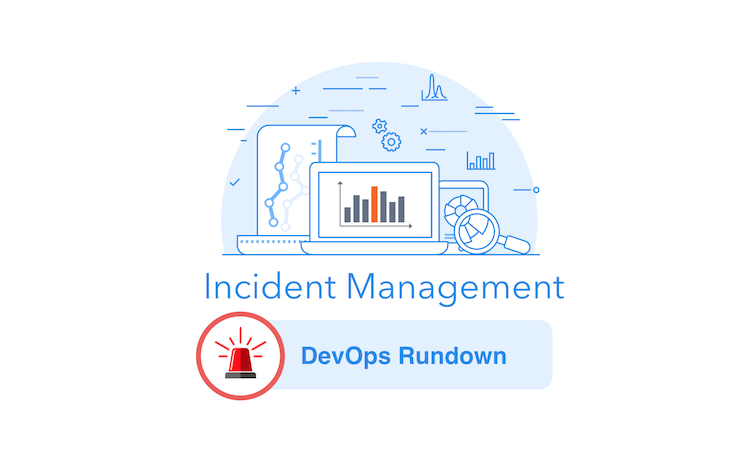 At the end of their week, they write up a quick report outlining any operational issues that were seen, and the On Call Me Maybe team produced an application which helped our on-call engineers write up these reports. Qualtrics Interview Scheduler. When you are doing as much interviewing as we are doing, scheduling interviews becomes a pretty complicated task (finding eligible interviewers, dealing with free/busy times, and finding rooms for the interview to take place). One team wrote a tool to completely automate this process. Very cool! 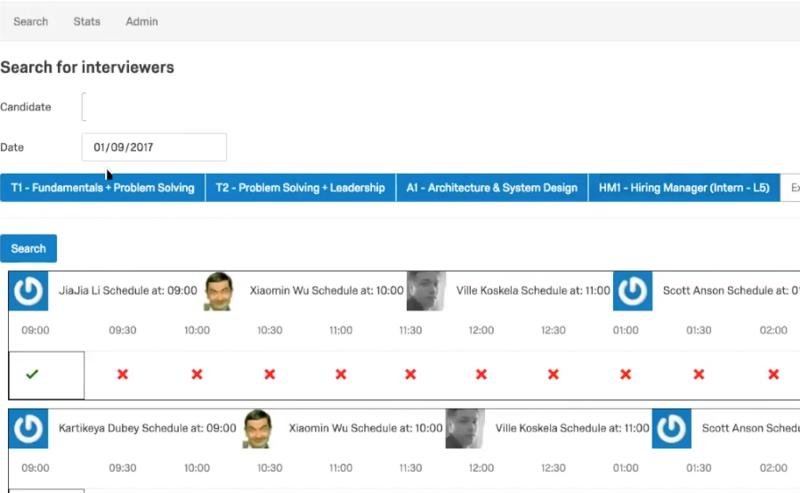 The interface for the interview scheduling project. All in all, I would say that our first Qualtrics hackathon was very much a success. In future iterations, we will work harder to make sure that we have even more participation from all corners of the organization (including non-Engineering teams, like Sales or Marketing) and we are going to try and pull in some of the principles behind Design Thinking to see what happens when we provide a framework for teams to think about practical, creative resolutions for the problems that we’re grappling with. More than anything, I was blown away by the breadth of applications that were built using the platform that we’ve built at Qualtrics. It was a reminder of how incredible an opportunity we have ahead of us. And although I didn’t directly participate in the hackathon, I left it feeling invigorated, and inspired, by the creative and dedicated teams that were involved. I know that feeling was shared by everyone who participated, and for that reason alone, we’ll continue to hold hackathons for as long as I’m running the Engineering organization.